The Office Open XML Formats are based on XML and ZIP archive technologies. The new file format in Microsoft Office Word 2007 divides the file into document parts, each of which defines a part of the overall contents of the file. You can easily create, change, add, or delete data in a Word 2007 file programmatically or manually. 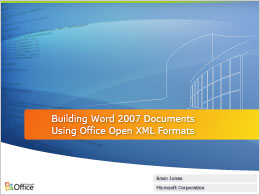 To illustrate how document parts, content type items, and relationship items work together, this section walks through the process of building a Word XML format document in Word 2007. To create a Word 2007 document that contains content type and relationship items, you need to create a root folder that contains a specific folder and file structure, as shown in Figure 1. After you create all folders and files, the next section walks you through adding the required XML code to each document part. Copy the following code into a new file and save it as app.xml inside the docProps folder. Copy the following code into a new file and save it as core.xml inside the docProps folder. Copy the following code into a new file and save it as document.xml inside the word folder. Copy the following code into a new file and save it as .relsinside the _rels folder. Note that the structure of a content type definition file looks like the following code. Copy the above code into a new file and save it as [Content_Types].xml inside the root folder. This reserved file name is used by the Open Packaging Conventions to define the content types of all files in the package. Do not simply add the complete simpledocument folder to a ZIP file or you get an internal error while opening the file in Word 2007. You need to specifically add all the subfolders of the simpledocument folder to the ZIP archive. Now, you can open this file in Word 2007 and see the contents of the package. The file format in Word 2007 consists of a compressed ZIP file, called a package. This package holds all of the content that is contained within the document. You can extract and open the files in the package to reveal component parts that give you access to the structures that compose the file. Figure 2 shows the file structure of a sample Word 2007 document. You can replace and add entire document parts to change the content, properties, or formatting of Word 2007 documents. For more information about the Word 2007 file format, read the article Walkthrough: Word 2007 XML Format. You can also build Word 2007 documents programmatically by using the Microsoft WinFX System.IO.Packaging class. For example, by using the Microsoft WinFX System.IO.Packaging class, you can create a document part with the PackagePart.CreatePart method. For more information about PackageParts, see the PackagePart Class reference documentation in the Microsoft Windows SDK.